Jan. 29 (Bloomberg) -- Crude oil traded below $74 a barrel on concern the pace of recovery in the U.S., the biggest energy consumer, is slowing and as the dollar rose amid speculation Greece won’t be able to finance its budget deficit. Oil is poised for a third weekly decline after U.S. equities dropped to the lowest level in 11 weeks, eroding confidence that economic growth will rebound. The dollar strengthened against the euro, limiting investor demand for commodities. Crude oil for March delivery traded at $73.70 a barrel, up 6 cents, in electronic trading on the New York Mercantile Exchange at 9:02 a.m. Singapore time. Yesterday, the contract fell 3 cents to $73.64. Prices are poised for a 1.1 percent decline for the week. The S&P 500 dropped 1.2 percent yesterday to 1,084.53, the lowest close since Nov. 6. The Dow Jones Industrial Average declined 1.1 percent to 10,120.46. The dollar traded at $1.3943 per euro at 11:31 a.m. Sydney time, from $1.3971 yesterday. The 16-nation euro fell yesterday against most of its major counterparts as the cost to insure Greece’s sovereign debt rose to a record. The Organization of Petroleum Exporting Countries will increase oil shipments by 1.5 percent in the four weeks ending Feb. 13 on continuing demand from Asia, according to tanker- tracker Oil Movements. OPEC, which supplies about 40 percent of the world’s crude, will ship 23.21 million barrels a day in the month ending Feb. 13, compared with 22.87 million a day in the four weeks to Jan. 16, the Halifax, England-based consultant said yesterday. Brent crude oil for March settlement fell 11 cents, or 0.2 percent, to $72.13 a barrel on the London-based ICE Futures Europe exchange yesterday. Jan. 28 (Bloomberg) --Soybeans rose from a three-month low on speculation that demand will increase for record supplies from the U.S., the world’s largest grower. Export sales of soy-based animal feed and vegetable oil in the four weeks ended Jan. 21 were more than twice those in the same period a year earlier, the U.S. Department of Agriculture said today in a report. Soybean sales since Sept. 1 have risen 43 percent from a year earlier to 34.564 million metric tons, the most ever, USDA data show. “Export sales of soybean meal and oil were very good,” said Mike Zuzolo, the president of Global Commodity Analytics and Consulting in Lafayette, Indiana. “There’s some pent-up demand” from livestock producers, food manufactures and speculators after prices slumped this month, Zuzolo said. Soybean futures for March delivery rose 2.75 cents, or 0.3 percent, to $9.3175 a bushel on the Chicago Board of Trade. Earlier the price fell to $9.21, the lowest level for the most-active contract since Oct. 8. Futures are down 11 percent since Dec. 31, heading for the biggest monthly drop since June, on forecasts for record world production. Brazil and Argentina, the second- and third-biggest shippers, together will harvest 118 million metric tons of the oilseed this year, up 33 percent from a year earlier, the USDA said Jan. 12. U.S. reserve supplies before this year’s harvest will total 245 million bushels (6.67 million metric tons), down from 255 million forecast last month, the USDA said. The surplus last year was 138 million bushels, the second-smallest since 1977. The rising demand for soybeans, animal feed and cooking oil will reduce inventories to 190 million bushels, Zuzolo said. “The demand bulls came back into the market today,” Zuzolo said. “March soybeans may bounce back toward $9.50 to $9.55” before the focus of investors returns to prospects for ample global supplies, he said. Soybeans are the second-biggest U.S. crop behind corn, valued last year at $27.4 billion, USDA figures show. CPO 3rd month Apr futures contract traded RM22 higher to close at RM2451 levels as compare to previous trading sessions with a total of 10.411 lots traded in the market. CPO price opened and traded higher during trading sessions as crude oil and soybean oil electronic trading were traded positively despite both product plunge during overnight trading. CPO price traded higher after attempt to penetrate support levels at RM2400 regions in the previous trading sessions despite new low from last attempt at RM2393 levels. Technically, CPO price seems encounter some resistance levels at RM2469 regions. 78.6% Fibonacci resistance levels in the hourly price chart. Current situation for CPO price trading seems crucial as the Bull and Bear seems embattling within range from RM2400 to RM2500 regions. It’s important for CPO price to remain trading above support levels at RM2434 and RM2410 regions which directly indicate short term reversal towards bullish after CPO price have been traded lower for 4 consecutive weeks. 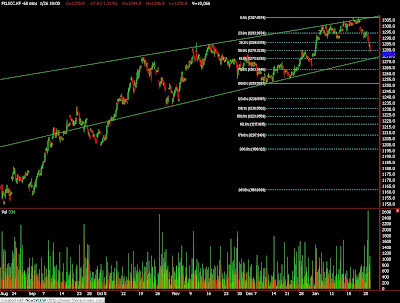 Resistance levels were seen at RM2490 and RM2530 regions. FKLI Jan Futures contract rebound 5.5 points lower to close at 1267 levels as compare to previous trading session to with a total of 6,316 lots traded in the market. FKLI opened and traded higher trading sessions as regional indices and Dow Jones electronic trading were traded very encouraging after a week of heavy liquidation on stocks holding nearly in every major equity indices around the world. 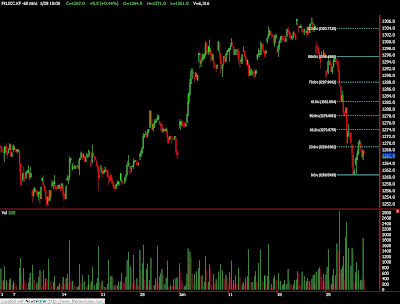 FKLI seem temporary holding above support levels at 1260.5; 61.8% and 178.6% Fibonacci support levels in the hourly price chart but yet to confirm correction phase has ended. Technically, FKLI would view remain in correction phase provided resistance levels at 1288 and 1295.5, 78.6% and 100% Fibonacci support level, were violated in the coming trading sessions. However, FKLI seen would rebound mildly after 4 consecutive day of bear rally with short term resistance level seen at 1273 and 1278 region. FKLI was seen supported around 1260.5 and 1247.5 regions in order for short term uptrend to remain affirm. Jan. 28 (Bloomberg) -- Oil rose after a U.S. government report showed inventories of crude unexpectedly fell last week and some investors took the view that a drop below $74 a barrel made futures attractive to buy. Oil pared yesterday’s decline after the Energy Department said U.S. crude supplies shrank 3.89 million barrels, or 1.2 percent, to 326.7 million. They were forecast to rise 1.5 million barrels, according to the median of 19 responses by analysts in the Bloomberg News survey. “We had a drop in crude stocks, which is definitely good,” said Ben Westmore, a minerals and energy economist at National Australia Bank Ltd. in Melbourne. Oil prices “in the mid-to-high $70s is going to be well supported, especially because most people expect the market balance to tighten over the period ahead,” he said. Crude oil for March delivery gained as much as 41 cents, or 0.6 percent, to $74.08 a barrel in electronic trading on the New York Mercantile Exchange. It was at $73.96 at 8:40 a.m. Singapore time. Yesterday, the contract fell $1.04 to $73.67, the lowest settlement since Dec. 21. Futures had fallen 1.4 percent yesterday after gasoline supplies climbed 1.99 million barrels to 229.4 million last week, the highest level since March 2008, the Energy Department report said. Distillate stockpiles, a category that includes heating oil and diesel, rose 358,000 barrels. Refineries ran at 78.5 percent of capacity, little changed from 78.4 percent in the week ended Jan. 15. That was the lowest level since at least 1989, apart from instances when hurricanes affected Gulf Coast capacity. Crude oil has dropped 11 percent since Jan. 8 amid concern that the U.S. will limit trading by banks and China will take more steps to cool its economy. Gains in the dollar have also reduced the appeal of commodities as an alternative investment. The dollar traded at $1.4027 per euro at 11:33 a.m. in Sydney, from $1.4024 yesterday. Brent crude for March settlement dropped $1.05, or 1.4 percent, to $72.24 a barrel on the London-based ICE Futures Europe exchange yesterday. Jan. 27 (Bloomberg) -- Gold fell in New York for the first time in three sessions as a rally by the dollar curbed the metal’s appeal as an alternative asset and some investors sold bullion to cover losses in equity markets. The dollar rose as much as 0.3 percent against a basket of six major currencies while European and Asian stocks declined on mounting concern that China and the U.S. will accelerate plans to unwind stimulus measures as their economies rebound. Before today, gold rose 21 percent in the past year as the dollar tumbled 7.4 percent. “Gold is on the defensive because of the dollar,” said Marty McNeill, a trader at R.F. Lafferty Inc. in New York. Gold futures for April delivery dropped $13.80, or 1.3 percent, to $1,085.70 an ounce on the Comex division of the New York Mercantile Exchange. The Dow Jones Stoxx 600 Index of European shares closed at the lowest level in more than a month. It has slid 2.6 percent this year as the U.S. called for limits on risk-taking by banks and China moved to restrict lending and cool economic growth. “If stocks continue to fall, people may have to liquidate their gold positions,” said Bernard Sin, the head of currency and metals trading at bullion refiner MKS Finance SA in Geneva. Gold gained for a ninth year in 2009 as the Federal Reserve maintained interest rates near zero percent to revive growth, driving the dollar lower. The Fed will keep its key overnight rate unchanged today as officials conclude a regular monetary- policy meeting, according to all 93 economists surveyed by Bloomberg. Gold will rebound, approaching $1,300 in the next six months, on increased investment demand, Investec Global Gold Fund said in a report. The “long-term floor” will be $1,000, Investec said. Silver futures for March delivery fell 42 cents, or 2.5 percent, to $16.44 an ounce. Platinum futures for April delivery declined $39.20, or 2.6 percent, to $1,492.10 an ounce. Palladium for March delivery slid $10.80, or 2.5 percent, to $416.75 an ounce. Jan. 28 (Bloomberg) -- The dollar rose to a six-month high against the euro on speculation the Federal Reserve will relax its low-interest rate stance amid signs the U.S. economy is gathering momentum, boosting demand for the nation’s assets. The dollar was near a four-month high against the Swiss franc after Kansas City Fed President Thomas Hoenig said the time has come to change the promise to keep rates low and before a report forecast to show the U.S. economy expanded at the fastest pace in almost four years. The euro was near its weakest in nine months against the yen on concern that budget deficits in the 16-nation region will widen, backing the case for the European Central Bank to keep interest rates low. The dollar advanced to $1.4004 per euro as of 10:01 a.m. in Tokyo from $1.4024 in New York yesterday, after climbing to $1.3990, the strongest since July 15. The dollar was at 90.14 yen from 90 yen. The euro bought 126.26 yen from 126.25, after falling to 125.24 yesterday, the weakest since April 28. The greenback traded at 1.0523 francs from 1.0501 yesterday, when it touched 1.0526, the highest level since Sept. 8. The Fed reiterated at the conclusion of its two-day policy meeting yesterday that interest rates will stay low for an “extended period” and held its target lending rate at zero to 0.25 percent. The Fed restated its intention to cease buying mortgage-backed securities in March. The Nikkei 225 Stock Average rose 0.6 percent after the Standard & Poor’s 500 Index yesterday advanced 0.5 percent. “The dollar-yen will be supported as long as Asian stocks hold up after U.S. stocks went up a bit and the FOMC meeting caused the dollar to be bought back,” Akane Vallery Uchida, a currency strategist at Royal Bank of Scotland Group Plc in Tokyo, wrote in a research note today. The Dollar Index, which IntercontinentalExchange Inc. uses to track the greenback against the currencies of six major U.S. trading partners including the euro and yen, increased 0.2 percent to 78.813. Economists in a Bloomberg survey forecast U.S. gross domestic product expanded 4.6 percent in the fourth quarter after gaining 2.2 percent in the third. The Commerce Department in Washington is set to release the data tomorrow. That would be the strongest since the first three months of 2006. The euro traded near a five-month low versus the pound on speculation that Greece and other countries in the euro area will struggle to cut their fiscal deficits, supporting the case for the ECB to maintain its 1 percent benchmark interest rate. The European Commission said in a report yesterday that finance ministers agreed Greece “had not taken effective action to correct the deficit by the 2010 deadline agreed at the beginning of 2009.” Portugal’s 2010 budget plan may not be enough to achieve the pledge of trimming the deficit by more than half in three years, risking a downgrade of its creditworthiness, economists and bond analysts said. The euro traded at 86.76 pence from 86.73 pence yesterday. It touched 86.51 pence on Jan. 20, the lowest since Aug. 21. FCPO April Futures contract traded RM22 higher as compare to previous trading sessions to close at RM2429 with a total of 13,892 lots traded in the market. CPO price was traded wild during trading sessions after search for high and low during trading sessions as soybean oil and crude oil traded weak during electronic trading while firm on overnight trading. FCPO price manage to penetrate previous low levels at RM2407 while searched new low at RM2393 regions. 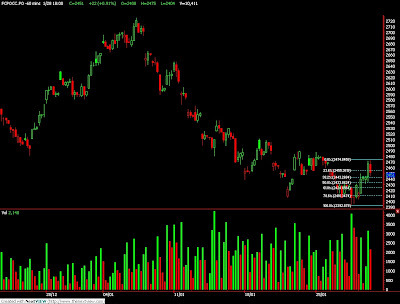 Technically, CPO price seems traded on weak side after attempt to search for lower support during trading sessions. CPO would remain bearish on short term trading provided resistance levels at RM2445 and RM2490 regions were not violated during trading sessions while support level remain at RM2410 and RM2358 regions, both were 50% and 61.8% Fibonacci support levels. Breach of resistance levels at RM2445 and RM2490 shall indicates further buying interest as CPO price seems highly possible to reverse towards upside to resume previous uptrend on long term trading. FKLI January Futures contract was plunge another 16.5 points lower as compare to previous trading session to close at 1261.5 levels with a total of 11,011 lots traded in the market. FKLI was traded lower despite opened higher in the 1st trading sessions as regional indices were traded optimistic before plunge lower in the 2nd trading sessions. FKLI continue to trade lower after penetrate previous support levels at 1278 regions; 38.1% Fibonacci support level, and continue traded lower to flirt with support levels at 1260.5; 61.8% Fibonacci support levels, before FKLI closed for trading sessions. 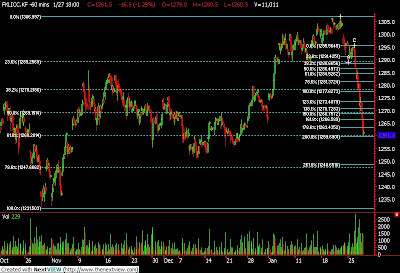 Technically, FKLI seems nearly reach 200% Fibonacci projection levels at 1259.5 regions before end of trading sessions. However, FKLI view remain bearish on short term basis provided resistance levels at 1288 and 1295.5 were not violated during trading sessions while support levels remain seen at 1259.5 and 1247.5 regions; 78.6% Fibonacci support levels. Jan. 27 (Bloomberg) -- Crude oil traded below $75 a barrel after falling as the dollar strengthened against the euro, reducing the appeal of commodities as an alternative investment. Oil dropped 0.7 percent yesterday as the U.S. currency gained against its major counterparts on speculation China will take further steps to cool its economy. A U.S. government report today will probably show oil supplies in the biggest energy using nation rose, according to a Bloomberg News analyst survey. Crude oil for March delivery traded at $74.67 a barrel, down 4 cents, in electronic trading on the New York Mercantile Exchange at 10:59 a.m. Sydney time. Yesterday, the contract dropped 55 cents to settle at $74.71. Oil stockpiles reported by the Energy Department probably climbed 1.58 million barrels in the week ended Jan. 22 from 330.6 million the prior week, according to the median of 18 analyst estimates in the Bloomberg News survey of analysts. Refining rates, already at their lowest level outside the Atlantic hurricane season since at least 1989, probably fell 0.1 percentage point. Inventories of crude oil fell by 2.23 million barrels last week to 326.1 million, the American Petroleum Institute said yesterday. Supplies of distillate fuel, a category that includes heating oil and diesel, dropped by 1.98 million barrels. Crude dropped yesterday on speculation that oil demand may wane in China, where banks have begun restricting new loans in response to a push by regulators to contain credit. Lending growth in China slowed in the third week of January from the month’s first two weeks, the Shanghai Securities News reported yesterday, citing unidentified people. “China has been underpinning demand for oil and other commodities, so the idea that they’re going to rein things in is certainly a negative for sentiment,” Hassall said. The dollar traded at $1.4082 a barrel at 10:59 a.m. Sydney time, from $1.4072 yesterday. Brent oil for March settlement declined 40 cents, or 0.5 percent, to $73.29 a barrel on the London-based ICE Futures Europe exchange yesterday. Jan. 26 (Bloomberg) --Soybeans rose the most in more than a week on speculation that this month’s slump to the lowest level 15 weeks may encourage investors to buy contracts to close out profitable bets on lower prices. In six of the past seven weeks, hedge funds and other large speculators increased their bets that soybeans would fall, with so-called short positions on Jan. 19 reaching the highest level since October, government data show. Soybeans fell as much as 11 percent this month to $9.32 a bushel in Chicago today, after the government said on Jan. 12 that U.S. farmers harvested the biggest crop ever last year. Soybean futures for March delivery rose 7 cents, or 0.7 percent, to $9.475 a bushel on the Chicago Board of Trade, the biggest gain since Jan. 13. Earlier, futures slipped to the lowest level since Oct. 9. The price fell this month on signs that demand will dwindle for shipments from the U.S., the world’s biggest exporter and producer. Brazil and Argentina, the second- and third-biggest growers, together will harvest a record 118 million metric tons this year, the USDA said earlier this month. Hot, dry weather this week will reduce soil moisture and increase stress on crops in Argentina before storms develop on Jan. 30 and Feb. 2, said Mike Tannura, the president of T-Storm Weather in Chicago. As much as 1 inch (2.5 centimeters) of rain will fall over the weekend and cooler temperatures will improve crop conditions, Tannura said today in a note to clients. “We have had 10 days of dry weather that may have encouraged some buying,” Hannagan said. “Prices could fall to $9.15” should rainfall during the next week improve crop prospects, he said. Jan. 26 (Bloomberg) -- Gold futures in New York rose on speculation that the dollar’s rally will stall, boosting the appeal of the precious metal as an alternative investment. The dollar rose as much as 0.6 percent against a basket of six major currencies before retreating. Gold is up 21 percent in the past year as the dollar fell 7.4 percent. “As long as the dollar doesn’t strengthen anymore from here, gold is a buy,” said Frank McGhee, the head dealer at Integrated Brokerage Services in Chicago. Gold futures for April delivery rose $2.70, or 0.3 percent, to $1,099.50 an ounce on the New York Mercantile Exchange’s Comex unit. Earlier, the price dropped to $1,086.50. Gold also gained on speculation the precious metal will resume its long-term rally, after the most-active futures failed to drop below its 100-day moving average of about $1,085, which some analysts said may create buying interest. 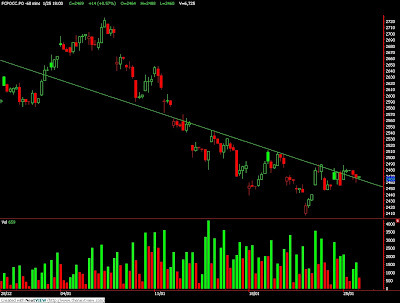 “The bottom line is that gold bounced from a technical breakout point, so you’ve got buyers coming in,” said Tom Schweer, a senior market strategist at LaSalle Futures Group in Chicago. The price hasn’t traded below its 100-day moving average since mid-July, and gold has found support near that level since at least the end of 2008, data show. The metal rose for the ninth straight year in 2009, surging 24 percent and touching a record $1,227.50 on Dec. 3. Silver and platinum, precious metals that have wider industrial uses than gold, fell on speculation China’s moves to curb lending will slow global growth and dampen demand. China is starting to take steps to cool the economy, which grew in the fourth quarter at the fastest pace since 2007. The central bank ordered lenders on Jan. 12 to raise the ratio of deposits they hold in reserve, limiting the amount of cash available for loans. Silver for March delivery fell 28.5 cents, or 1.7 percent, to $16.86 an ounce on the Comex. Platinum futures for April delivery slipped $14.80, or 1 percent, to $1,531.30 an ounce on the Nymex. Palladium futures for March delivery lost $12.45, or 2.8 percent, to $427.55 an ounce. Jan. 27 (Bloomberg) -- The yen traded near a nine-month high against the euro on concern the global economic recovery will slow, increasing demand for Japan’s currency as a refuge. The yen was near a five-week high against the dollar as the International Monetary Fund said the global financial system remains “fragile,” with sovereign debt posing a risk to markets. The euro may fall against the dollar for a second day after European Central Bank executive board member Juergen Stark said yesterday policy makers are “seriously concerned” about mounting deficits in the region. The yen traded at 126.23 per euro at 8:29 a.m. in Tokyo from 126.16 in New York yesterday, when it reached 125.68, the strongest level since April 28. Japan’s currency fetched 89.66 per dollar from 89.65. It touched 89.35 yesterday, the highest since Dec. 18. The dollar was at $1.4079 per euro from $1.4072. It reached $1.4029 on Jan. 21, the most since July 30. Banks may need to significantly increase their capital to support the credit recovery and help sustain economic growth, the Washington-based IMF said yesterday in an update to its Global Financial Stability Report. European governments may need to borrow 2.2 trillion euros ($3.1 trillion) from capital markets in 2010, or 19 percent of GDP, to finance deficits and roll over existing debt, Fitch Ratings said yesterday. The yen briefly pared gains yesterday after Standard & Poor’s said Japan’s rating could be cut if the government fails to come up with measures to spur growth and economic data remain weak. S&P retained Japan’s AA long-term rating. The Federal Reserve will keep its key overnight rate in a range between zero and 0.25 percent today, according to all 93 economists in a Bloomberg News survey. CPO 3rd month Apr futures contract plunge RM62 lower to close at RM2407 levels as compare to previous trading sessions with a total of 13.659 lots traded in the market. CPO price opened lower and traded lower due to soybean oil and crude oil weak trading on overnight sessions and electronic trading sessions as premium pricing on the winter season ended in the western countries. CPO price closed par as previous low level at RM2407 after manage to penetrate previous support levels at RM2455 and RM2434 regions. 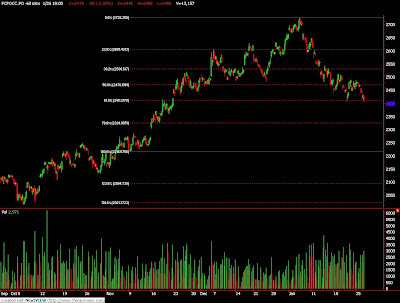 Technically, CPO price would being triggered further selling activities provided support levels at RM2400 and RM2358; both were 61.8% Fibonacci support levels in the hourly chart. Failure to hold above support levels at RM2400 shall indicates short term bear trend for CPO price while long term support still remain at RM2120 region. However, CPO price shall encounter some degree of selling pressure around resistance levels at RM2448 and RM2512 regions provided CPO price was riding on bear market on short term basis. FKLI Jan Futures contract plunge 17 points lower to close at 1278 levels as compare to previous trading session to with a total of 10,066 lots traded in the market. FKLI plunge lower as regional indices were traded lower during overnight trading despite Dow Jones overnight trading was traded above the settlement benchmark. FKLI fails to above previous month low at 1289 support regions after manage to rebound towards 1295.5 levels in the morning trading sessions. Technically, FKLI seems rest on support levels at 1279 regions; 50% and 123.6% Fibonacci support, but further selling activities would be encounter in the case support levels at 1272 and 1251 fails to against the selling pressure. 1272.5 support levels was view as trend line support in the hourly chart. However, FKLI remain on correction phase provided resistance levels at 1295.5 and 1300 were not violated in the coming trading sessions. Jan. 26 (Bloomberg) -- Palm oil exports from Malaysia, the world’s second-largest producer, may gain this year as the global economy recovers and China’s demand rises, according to Plantation Industries and Commodities Minister Bernard Dompok. Malaysia plans to export more to China in 2010, Dompok said today. The government would be “happy” if prices ranged from 2,400 ringgit ($706) to 2,600 ringgit a metric ton this year, he said. Futures prices ended yesterday at 2,469 ringgit. Palm oil in Kuala Lumpur surged 57 percent last year as demand recovered, benefiting Malaysian producers including IOI Corp. and Sime Darby Bhd. Dompok’s preferred price range tallies with his comments from last July, when he said that a level of at least 2,500 ringgit would suit the government. Palm oil on the Malaysia Derivatives Exchange -- the benchmark price in Asia -- averaged 2,233 ringgit a ton last year, and traded at 2,452 ringgit at 11:24 a.m. local time today. The commodity, about 90 percent of which is produced in Indonesia and Malaysia, is used in foods and as a fuel additive. Malaysia’s palm oil production is forecast to gain 4.9 percent this year to a record 17.8 million tons, according to an October forecast from the Finance Ministry. Exports of palm oil products may be worth more than 100 billion ringgit by 2020 compared with 62.5 billion in 2008, he said in the address. “The focus by 2020 is to generate exports of more value-added products, services and palm-oil-related technologies,” Dompok said in the speech. Jan. 26 (Bloomberg) -- Crude oil traded little changed near $75 a barrel after rising from a one-month low yesterday as a rebound in U.S. equities and a weaker dollar encouraged investors to buy commodities. Oil climbed 1 percent and stocks rallied on signs Ben S. Bernanke will keep his job as Federal Reserve Chairman. It also gained after a worse-than forecast slump in U.S. home sales failed to push oil below $74 a barrel. A report tomorrow will probably show U.S. refiners cut operating rates for a second week amid weak demand, according to a survey of analysts. “The housing sales were very poor,” said Tom Hartmann, commodity broker at Altavest Worldwide Trading Inc. in Mission Viejo, California. “We’re coming down from decade-highs for fuel and energy supplies, so $80 oil was just unsustainable. Even in the mid-seventies we’re going to have problems” given rising supplies and the risk of slower growth in Asia, he said. Crude for March delivery traded at $75.08 a barrel, down 18 cents, in after-hours electronic trading on the New York Mercantile Exchange at 8:39 a.m. in Singapore. The contract climbed 72 cents to $75.26 yesterday, its first gain in four days. Futures fell 10 percent in the preceding two weeks from a 15-month high of $83.95 a barrel. The Standard & Poor’s 500 Index advanced 0.5 percent to 1,096.78 in New York yesterday. The index is up 62 percent since March 9 as governments worldwide pledged more than $12 trillion to revive the economy. The Nikkei-225 Stock Average climbed 0.1 to 10,520.54 in Tokyo. Oil earlier yesterday fell to $74.06, close to the one- month low reached Jan. 22. Sales of existing U.S. homes sales plunged by a more than anticipated 17 percent in December, the most since the series started in 1968. Crude’s direction from here is “sketchy,” Altavest’s Hartmann said. A decline through $74, near the March contract’s 200-day moving average, may trigger a slide that would take prices back to $63 by the second quarter, he said. A U.S. Energy Department report tomorrow will probably show crude-oil inventories rose last week as imports gained and refineries shut units, based on a Bloomberg survey of analysts. Stockpiles probably climbed 1.58 million barrels in the week ended Jan. 22 from 330.6 million the prior week, according to the median of 12 analyst’s estimates. Refining rates, already at their lowest outside the Atlantic hurricane season since at least 1989, probably fell 0.3 percentage point. Brent oil for March settlement increased 86 cents, or 1.2 percent, to $73.69 a barrel on the London-based ICE Futures Europe exchange yesterday. Oil prices will rise to $95 a barrel by the end of the year as demand recovers, Morgan Stanley said in a report by Hussein Allidina, a commodities analyst. Declining crude inventories and the improving economy will boost prices this year and take them to an average $100 a barrel in 2011, according to the report. Prices between $70 and $80 are “almost perfect” and provide sufficient returns for investment without harming the global economy, Saudi Arabia’s Oil Minister Ali al-Naimi said yesterday. Saudi Arabia is the biggest producer in the Organization of Petroleum Exporting Countries. The group, which sells about 40 percent of the world’s oil, is pumping about 1.77 million barrels a day more than output quotas set late 2008 to prevent a glut. Iraq is not restricted by quota. Jan. 25 (Bloomberg) -- Gold prices rebounded on speculation that the dollar will retreat, boosting the appeal of the precious metal as an alternative investment. The greenback has been little changed against a basket of six major currencies since reaching a five-month high on Jan. 21. Gold is up 21 percent in the past year, while the dollar dropped 8.7 percent. Gold futures for February delivery rose $6, or 0.6 percent, to $1,095.70 an ounce on the Comex division of the New York Mercantile Exchange. On Jan. 22, the metal touched $1,081.90, the lowest level since Dec. 23. In 2009, gold rallied for a ninth straight year as the Federal Reserve kept interest rates close to zero percent to revive growth, driving the dollar lower. Last week, gold dropped 3.6 percent, the most in six weeks. The slide may encourage some investors to buy, especially in China, James Moore, an analyst at London-based TheBullionDesk.com, said in a report. “With rising physical demand ahead of the Lunar New Year, dips are likely to be viewed as good bargain-hunting opportunities,” Moore said. China’s weeklong Lunar New Year holidays start on Feb. 14. Silver futures for March delivery rose 21.3 cents, or 1.3 percent, to $17.145 an ounce on the Comex. Platinum futures for April delivery rose $1.60, or 0.1 percent, to $1,546.10 an ounce in New York. Palladium futures for March delivery fell 10 cents to $440 an ounce. Jan. 26 (Bloomberg) -- The yen fell against all major counterparts as U.S. President Barack Obama said Federal Reserve Chairman Ben S. Bernanke “has my strongest support” for a second term, boosting demand for higher-yielding currencies. The dollar may drop on prospects the Fed will keep its target lending rate near zero to sustain an economic recovery in the world’s largest economy. The Bank of Japan is forecast to keep interest rates on hold when it completes its two-day policy meeting today. The pound rose before a U.K. report that may show the British economy grew for the first time since the first quarter of 2008. The yen declined to 128.13 per euro as of 9:27 a.m. in Tokyo from 127.75 in New York yesterday. Japan’s currency weakened to 90.46 per dollar from 90.28. It touched 89.79 on Jan. 22, its strongest level since Dec. 18. The dollar traded at $1.4164 per euro from $1.4151. It appreciated to $1.4029 on Jan. 21, its strongest level since July. Obama said in an interview with ABC News that Bernanke is the right person for the job. “What we need is somebody at the Federal Reserve to make sure the progress we’ve made in stabilizing the economy continues,” he said in the interview broadcast yesterday. FKLI Jan Futures contract traded 0.5 point lower to close at 1295 levels as compare to previous trading session to with a total of 4,862 lots traded in the market. FKLI was opened lower due to Dow Jones overnight trading but recovered during intraday trading as regional indices were recovering from previous consecutive 4 days selling activity. FKLI seems holding above previous low levels at 1289 regions; which 50% Fibonacci support levels seen at 1290 regions. 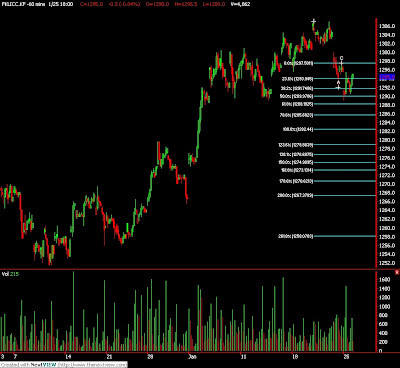 FKLI manage to retrace 78.6% Fibonacci after manage to recover towards 1295 regions before end of trading sessions. Technically, FKLI seems complete minor downtrend wave count at 1289 regions at 50% Fibonacci projection and rebound wave count anticipate 1300 and 1307 seen as critical resistance levels if FKLI persist with correction wave. However, FKLI are required to penetrate support levels at 1289 and 1278 in the coming trading sessions in order correction phase still remain intact. CPO 3rd month Apr futures contract traded RM14 higher to close at RM2469 levels as compare to previous trading sessions with a total of 6,725 lots traded in the market. CPO price opened higher as export figure from ITS and SGS shows favorable interest on CPO demand despite crude oil and soybean oil overnight trading were closed weak sessions despite opened lower as soybean oil and crude oil overnight trading were traded weak. CPO price manage holding above support levels at RM2455 regions; 78.6% Fibonacci support levels and penetrate above resistance trend line; previous high regions at RM2483 regions in the hourly price chart. 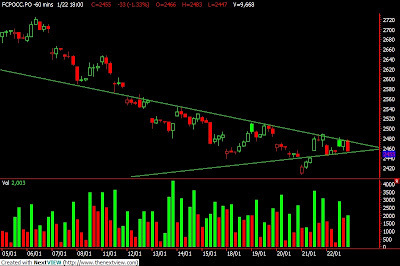 CPO price seems holding above the trend line after several attempts to trade lower the trend line. Technical, we anticipate CPO price traded on wave count 3 provided support levels at RM2455 and RM2434 must not violated during trading sessions while resistance levels were seen at RM2512 and RM2543 regions. Jan. 25 (Bloomberg) -- Crude oil traded near a one-month low as sliding equity markets and expectations of interest-rate increases in China dented investor confidence in the strength of the global economic recovery. OPEC nations must improve their compliance with the group’s output quotas to prevent further pressure on oil prices, Shokri Ghanem, chairman of Libya’s National Oil Corp., said yesterday. A report today in the U.S., the world’s largest oil user, will probably show existing home-sales fell for the first time in four months, according to a Bloomberg News survey of economists. Crude oil for March delivery was at $74.62 a barrel, up 8 cents, in after-hours electronic trading on the New York Mercantile Exchange at 10:04 a.m. in Singapore. Earlier the contract fell as much as 43 cents, or 0.6 percent, to $74.11. It dropped 2 percent to $74.54 on Jan. 22, the lowest settlement since Dec. 22. Prices slumped 4.9 percent last week as U.S. gasoline stockpiles reached a 22-month high, equities and commodities tumbled on the nation’s bank reform plans, and investors fretted that China will raise interest rates to slow growth in the world’s second-largest energy consumer. The Sabine Neches Waterway, the Texas ship channel serving four refineries that process about 6.5 percent of total U.S. capacity, remained closed indefinitely after a collision between a tanker and vessel spilled about 11,000 barrels of oil, the U.S. Coast Guard said. Cleanup crews are working 24-hours daily, Coast Guard Petty Officer Richard Brahm said in a telephone interview from Port Arthur, Texas. The waterway may open to vessel traffic within five days, Dow Jones reported earlier, citing Capt. J.J. Plunkett of the Coast Guard. The vessel, owned by AET Tankers of Malaysia, was traveling to Exxon Mobil Corp.’s Beaumont refinery, one of four located near the waterway. The other three are operated by Royal Dutch Shell Plc’s Motiva Enterprises, Valero Energy Corp. and Total SA. The four plants have a combined processing capacity of 1.15 million barrels of oil a day. Brent oil for March settlement was at $72.95 a barrel, up 12 cents, on the London-based ICE Futures Europe exchange at 10 a.m. Singapore time. It fell 2.3 percent $72.83 on Jan. 22. New York oil futures reached a 15-month high of $83.95 a barrel on Jan. 11 as rising equity markets emboldened investors and traders speculated freezing temperatures in Europe and the U.S. would help draw down above-average distillate supplies. Prices plunged 10 percent the past two weeks as U.S. fuel stockpiles and temperatures rose, China increased reserve requirements for its banks, and the Standard & Poor’s 500 Index fell to a seven-week low. Asian equities fell for a sixth day with the MSCI Asia Pacific Index down 0.8 percent as of 10:17 a.m. Tokyo time. The Nikkei-225 Stock Average was off 1.3 percent. Hedge-fund managers and other large speculators reduced their bets on rising oil prices for the first time in five weeks, based on U.S. Commodity Futures Trading Commission data. Speculative net-long positions, the difference between orders to buy and sell the commodity, fell 1 percent to 134,381 contracts in the week ended Jan. 19, the commission said last week. Positions a week earlier were the highest in at least 27 years. The Organization of Petroleum Exporting Countries pumps about 40 percent of the world’s oil. The group slashed production quota’s late 2008 to prevent a glut as the world economy entered its worst recession since World War II. Oil will likely fluctuate between $75 and $85 a barrel this year as growth in Asia increases demand and on speculation by investors, Libya’s Ghanem said in an interview yesterday. FCPO April Futures contract traded RM33 lower as compare to previous trading sessions to close at RM2455 with a total of 9,668 lots traded in the market. CPO price was traded volatile during intraday trading sessions as traders intend to take in further position while crude oil and soybean oil electronic trading were traded wild towards both of directions. FCPO price manage to retrace towards 50% Fibonacci support levels at RM2448 regions before rebound higher towards 78.6% Fibonacci resistance levels at RM2480 regions before formed a symmetric triangle in the hourly and 15minute CPO price chart. 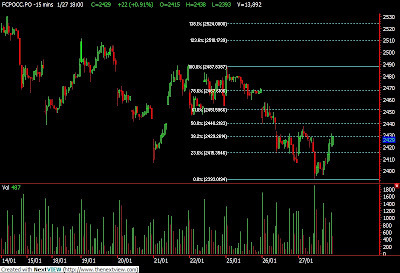 Technically, CPO price would further confirm on reverse upwards provided that support levels at RM2434 and RM2400; both are78.6% and 61.8% Fibonacci support levels, were not violated in the coming trading sessions. Any violated of these support levels shall indicate selling activity towards next support levels at RM2357 and RM2288 regions. However, CPO price would further confirm uptrend formation provided resistance levels at RM2490 and RM2512 fails to suppress buying interest during trading session. FKLI January Futures contract was traded 9 points lower as compare to previous trading session to close at 1295.5 levels with a total of 5,112 lots traded in the market. FKLI was finally plunge lower since open trading sessions as regional indices and Dow Jones overnight trading were traded weak due to news release on the financial sector for China and United Stated. FKLI traded lower after manage to break lower from the rising wedge formation in the hourly chart but manage to hold above 78.6% Fibonacci support levels at 1292.5 ranging from 1289 to 1307 regions. Technically, FKLI seems temporary complete short term wave 3 count on 100% at 1307.5 regions provided FKLI not trading above resistance levels at 1302 and 1307 region in the coming trading sessions. 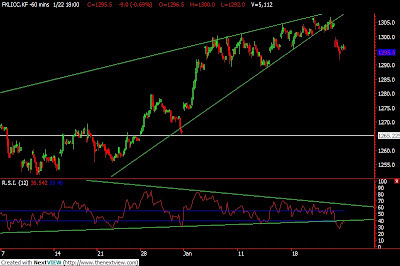 RSI in the hourly chart seems break down lower than support trend line and manage to close below the trend line indicates FKLI was seen temporary weak to trade higher for short term trading. Next nearest support seen at 1289 and 1279.5 despite medium term supports were seen at 1278 and 1260 regions in order for FKLI to remain intact with uptrend. Jan. 22 (Bloomberg) -- Crude oil fell to a one-month low after equities dropped on President Barack Obama’s proposed restrictions on risk-taking at financial institutions and speculation China will raise interest rates. Oil tumbled 2 percent as stocks decreased on the administration’s plan to bar banks from trading for their own accounts. U.S. refineries ran at 78.4 percent of capacity last week, the lowest rate outside the Atlantic hurricane season since at least 1989, the Energy Department said yesterday. Crude oil for March delivery fell $1.54 to $74.54 a barrel on the New York Mercantile Exchange, the lowest settlement since Dec. 22. Futures are up 71 percent from a year ago. March oil dropped 4.9 percent this week as declines in equity markets dented investor confidence and a stronger dollar reduced the appeal of commodities as an alternate investment. The Standard & Poor’s 500 Index slipped 1.7 percent to 1,097.74, with the financial sector down 3.1 percent. The Dow Jones Industrial Average declined 1.9 percent to 10,194.29. “Weak demand, China, risk aversion, downturn in equities, it’s a laundry list and a fairly ugly reversal,” said Tom Knight, vice president of trading and supply at Truman Arnold Cos. in Texarkana, Texas. President Obama’s plan will affect commodities trading done by “all the banks,” said Damian Honey, a partner at the law firm of Holman Fenwick Willan LLP in London. The Reuters/Jefferies CRB Index of 19 commodities declined 0.8 percent to 275.43, the lowest since Dec. 22. Gold futures for February delivery slipped $13.50, or 1.2 percent, to settle at $1,089.70 an ounce on the Comex division of the Nymex. It’s the first time gold closed below $1,100 this year. China’s 10.7 percent growth in the fourth quarter ignited concern that the nations responsible for leading the world out of a recession will raise borrowing costs to keep their economies from overheating. China is the second-biggest energy consumer after the U.S.
Goldman Sachs Group Inc. said it sees “significant upside risk” to its forecast for China’s oil demand this year, analysts including Jeffrey Currie said in an e-mailed report today. Goldman analysts had forecast demand growth of 625,000 barrels a day in 2010. Gasoline inventories climbed 3.95 million barrels to 227.4 million last week, the highest level since March 2008, the Energy Department said. Supplies of gasoline, crude oil and distillate fuel, a category that includes heating oil and diesel, were above the five-year average for the week. Gasoline for February delivery declined 1.72 cents, or 0.9 percent, to end the session at $1.9657 a gallon in New York, the lowest settlement since Dec. 22. Heating oil for February delivery slipped 4.4 cents, or 2.2 percent, to $1.9416 a gallon, the lowest close since Dec. 15. U.S. fuel consumption in the past four weeks dropped 1.8 percent from a year earlier, the report showed. Crude oil may fall next week as U.S. fuel use declines and refineries idle units, a Bloomberg News survey showed. Eighteen of 42 analysts and traders, or 43 percent, said oil will drop through Jan. 29. Sixteen respondents, or 38 percent, forecast an increase and eight said prices will be little changed. Brent oil for March settlement slipped $1.75, or 2.3 percent, to end the session at $72.83 a barrel on the London- based ICE Futures Europe exchange. It was the lowest settlement since Dec. 15. Brent is trading at a $1.71 a barrel discount to the New York contract, the most since Dec. 24. Higher U.S. prices may attract shipments from the North Sea. Oil volume in electronic trading on the Nymex was 537,776 contracts as of 3:21 p.m. in New York. Volume totaled 506,795 contracts yesterday, 10 percent below the average of the past three months. Open interest was 1.33 million contracts. The exchange has a one-business-day delay in reporting open interest and full volume data. Jan. 22 (Bloomberg) -- Gold futures dropped to a one-month low on speculation that President Barack Obama’s plan to restrict U.S. bank trading will reduce investment demand for commodities, including precious metals. The proposal to limit risk-taking by banks, preventing investments in hedge funds and private equity pools, may cost Goldman Sachs Group Inc. $4.67 billion in revenue next year, JPMorgan Chase & Co. said in a report. Investors poured $60 billion into raw materials in 2009, according to a Barclays Capital survey, fueling the biggest commodity rally since 1979. Gold futures for February delivery dropped $13.50, or 1.2 percent, to $1,089.70 an ounce on the New York Mercantile Exchange’s Comex unit, dropping 3.6 percent this week. Earlier, the most-active contract touched $1,081.90, the lowest price since Dec. 23. Gold fell for the third straight day, the longest slump in six weeks. Last year, investment in the SPDR Gold Trust, the biggest exchange-traded fund backed by the metal, surged 45 percent to as much as 1,134 metric tons. The total value of the fund grew 85 percent to $40 billion. Gold futures jumped 24 percent in 2009, the ninth straight annual gain, touching a record of $1,227.50 last month in New York. UBS AG, based in Zurich, and JPMorgan were among the top 10 holders of the SPDR ETF at the end of the third quarter, according to corporate filings. New York-based JPMorgan is the second-biggest U.S. bank. ETFs for platinum and palladium, which began trading in the U.S. for the first time on Jan. 8, also may shrink, analysts said. ETF Securities Ltd.’s ETFS Platinum Trust and Palladium Trust brought in $350 million in the first trading session, the Jersey, Channel Islands-based company said. Platinum futures for April delivery plunged $47.60, or 3 percent, to $1,544.50 an ounce in New York, the biggest decline for a most-active contract since Aug. 17. The metal fell 3.2 percent this week. March palladium futures tumbled $13.85, or 3.1 percent, to 440.10 an ounce, the biggest decline for a most-active contract since Dec. 22. The metal fell 1.7 percent this week, halting five weekly gains. Silver for March delivery dropped 57.8 cents, or 3.3 percent, to $16.932 an ounce. The metal slid 8.1 percent this week, the biggest decline since the end of October. Gold priced in dollars may rebound as Obama’s plan erodes the value of the greenback, said Dennis Gartman, a Suffolk, Virginia-based economist and the editor of the Gartman Letter. Jan. 23 (Bloomberg) -- The yen rallied against all of its major counterparts for a second week as President Barack Obama’s proposal to rein in banks and China’s possible increase in interest rates discouraged demand for higher-yielding assets. The dollar fell to a one-month low against the yen before next week’s Federal Reserve meeting on speculation the White House’s plan to curtail risk will reduce investment in the U.S. The euro posted its biggest drop in five weeks against the dollar on concern Greece will struggle to contain its budget deficit within the European Union’s limits. The dollar declined 1.1 percent to 89.82 yen this week, from 90.77 on Jan. 15, and touched 89.79 yesterday, the lowest since Dec. 18. The euro fell 1.7 percent to $1.4139, from $1.4387, after reaching $1.4029 this week, the lowest level since July 30. The euro slid 2.8 percent to 126.98 yen, from 130.61. Obama called on Jan. 21 for limiting the size and trading activities of financial institutions as a way to reduce risk taking and prevent another global crisis. The proposals would be part of an overhaul of regulations prohibiting banks from proprietary trading or investing in hedge funds. The Standard & Poor’s 500 Index fell for a second straight week, losing 3.9 percent and wiping out its gain for 2010. Fed policy makers will hold the target lending rate at zero to 0.25 percent at their Jan. 26-27 policy meeting, according to all of the 91 economists in a Bloomberg News survey. Futures on the CME Group exchange showed an 18 percent chance the central bank will lift its benchmark by at least a quarter-percentage point by its June meeting, compared with 26 odds a week ago. New Zealand’s dollar dropped 4.9 percent to 63.75 yen and South African’s rand decreased 4.1 percent to 11.76 yen this week on speculation Obama’s plan and China’s outlook will spur investors to reduce carry trades, in which they buy riskier assets with amounts borrowed in nations with low interest rates. China’s inflation accelerated to a more-than-forecast 1.9 percent in December and the economy grew 10.7 percent, the National Bureau of Statistics said in Beijing this week. The People’s Bank of China will raise interest rates by the end of June and also ratchet up banks’ reserve requirements, according to the median of 17 forecasts in a Bloomberg News survey. A survey on Jan. 8 indicated the bank would wait until the third quarter before lifting borrowing costs. Some of China’s banks were asked to reduce lending after a record 9.59 trillion yuan ($1.4 trillion) in new loans were made last year, the nation’s chief banking regulator, Liu Mingkang, said in an interview this week. The yen tends to rise during times of economic uncertainty because Japan’s trade surplus makes it less reliant on foreign capital. The Bank of Japan will hold its target lending rate at 0.1 percent at its meeting on Jan. 25-26, according to all of the 17 economists in a Bloomberg News survey. The euro weakened against the dollar after European finance ministers said on Jan. 19 the crisis in Greece is affecting other nations and Moody’s Investors Service said the success of the government’s budget plan “cannot be taken for granted.” The International Monetary Fund said on Jan. 20 that Portugal should begin reining in its deficit this year. Greece faces pressure from other European Union governments to tackle the crisis caused by a budget deficit more than four times the EU limit of 3 percent of gross domestic product. Sterling posted its biggest weekly drop against the dollar since the five-day period ended Dec. 25, falling 0.9 percent to $1.6114. The Office for National Statistics said the U.K.’s December retail sales by volume rose 0.3 percent, less than the median forecast of a 1.1 percent gain in a Bloomberg News survey of 27 economists. UniCredit SpA, the fourth-best forecaster on the pound versus the dollar last year, cut its 2010 prediction, citing the U.K.’s deteriorating growth prospects. “We lowered our target based on expectations the recovery in U.K. economic activity will remain very moderate at least for most of the first half,” Roberto Mialich, a senior global- currency strategist in Milan, said via e-mail this week.